Usually it is only thought of keeping the basic fixtures in the bathroom such as the sink, the toilet, a shower and or a tub, and some countertop space with storage. However, small bathrooms can really benefit from the installation of furniture. Bathroom countertops usually provide some storage space for small bottles or dish soap, and mirrored cabinets have some shelving to store smaller bottles. The cabinets can hold a small garbage can and the drawers provide some storage for hair dryers and other hair tools, makeup, and other toiletries. To gain more storage flexibility, these are some bathroom furniture design ideas for a small bathroom. Hanging lights look beautiful in bathrooms, and are a more decorative option than the standard ceiling lights which are usually found in bathrooms . There is a dramatic change to the feel of a bathroom if the sconce ceiling lights are changed to hanging lights or chandeliers. Chandeliers and hanging lights adds a romantic feel to the bathroom and a more even spread of light through the bathroom. Ceiling lights direct the light straight to the floor, and chandeliers spread the light out more evenly through the bathroom. Chandeliers look especially lovely when hung in the exact center of the room, or over a bathtub. A non electrical chandelier can even be hung over the bathtub, with places to put candles instead of using electricity. The candles on the chandelier can be lit during a bathtub for an alternate option of dimming the electric lights. The chandelier will look lovely when it’s not in use and the candle lit bath is soothing and relaxing. Mirrors are always a welcome addition to a room. Even if they are not large mirrors, the frames of small mirrors can be so beautiful and captivating. Decorative mirrors not only bring style and grace the walls with their unique glass cuts and frames, but mirrors hung on the wall can also help to make any space feel larger. A large decorative mirror hung on the bathroom wall can reflect the space in the bathroom, tricking the eye so that the room looks larger. If there is no room for furniture and even less room for cabinetry in the bathroom, hanging a decorative mirror is the best way to gain the illusion of space and furnished decoration in the room without installing cabinetry or having the bathroom remodeled. Most small toilets for small bathrooms have free space above the wall. In a small bathroom, take advantage of that space by using a small bathroom cabinet which sits over the toilet. This type of bathroom cabinet is called a toilet cabinet. 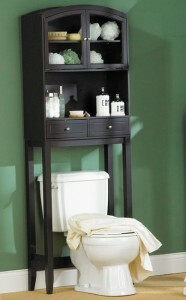 The top portion of the bathroom cabinet can hold towels, toilet paper, tissue boxes, or any other type of toiletries. The legs of the cabinet extend down the sides of the toilet and sit against the wall. This storage option utilizes the usually unused wall space above the toilet, and because it has legs it does not need to be attached to the wall. For a bathroom with limited storage space, a more cohesive and personalized option would be to have cabinetry built of customized size and style into the walls around the sink and toilet. Having a contractor who works with the bathroom remodel the space can be the difference between only adding a few shelves with a bathroom cabinet, and utilizing the space completely. Bathroom cabinets which are suited to a persons personal taste and design can be built around the toilets, along the walls, and around the bottom of the sink. With a remodel, the size of cabinets can be adjusted to that bathrooms need for space. All of the cabinets will coordinate in color depending on the type of wood and finish chosen, or if the cabinets are painted or made of a different material. This option creates so much space in the bathroom and can also transform the entire look and atmosphere of the bathroom. Bathroom cabinet ideas for small space is something most people think about. After all we all need more storage in our bathrooms. Cabinetry which is light in color or painted white tends to open up smaller bathroom spaces. If there are no linen cabinets near the bathroom, it can be inconvenient to bring the towels from the cabinet to the bathroom all the time. A small upholstered chair with arms can be the solution to this problem. The chair doesn’t necessarily have to be roomy enough to sit down on, but the chair can hold a stack of 6 towels at one time. If there is any extra room in a small bathroom for a chair large enough to sit down on, this could be the perfect place to sit down and undress before a shower, or to sit down on while painting toenails. Of course, if bathroom cabinetry was built into the space, there would be no need for the linen cabinet to be outside of the bathroom.